Happy Go Lucky, The Grant Life and Making Lemonade have featured my Goldfish Carrots this week. Thank you Singing Three Little Birds and It's A Blog Party for featuring my Shamrock Pins! Please join my list of Linky friends when you visit my blog! Thanks! Thank you Cheri at It's So Very Cheri for featuring "A Little Bit of Everything" this week on your blog! Tidy Mom, Creative Itch and Teagan's Travels have all featured my St. Pat's Hats ! Thank you all ! Please join my list of Linky friends when you visit my blog! Thanks! Thank you Sugar Bee for featuring my Stuffed Shells this week ! Thank you la bela vita for featuring my baby sweater and cap on her blog! Thank You "Bella Before And After" for featuring my "Broccoli Quiche"! Thank you A Creative Princess for featuring my Broccoli Quiche ! Thank you Fireflies and Jellybeans and Passionately Artistic for featuring my Green Bean Bundles ! 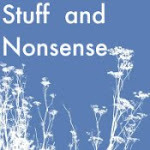 My Quick Quiche has been featured at It's So Very Cheri and Stuff and Nonsense- Thank you so much! 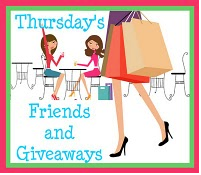 Be sure to check out the Thursday Friend's Cafe Blog Hop at Menopausal New Mom where A Little Bit Of Everything is honored to be the weekly guest host. Thank you to Tammy and Deb for including this blog. It's So Very Cheri has selected Holiday Pound Cakes to feature on her blog. "A Little Bit of Everything" is a finalist for a BLOSCARS (think Blog + Oscars) at Eisy Morgan in the "Most Creative" category. 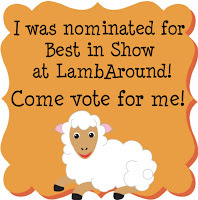 Stop by her blog and vote for "A Little Bit of Everything"
And the voting begins now! Thank you Bella Before and After for featuring my French Apple Cobbler! Check it out on her left side bar. Thank you Santa's Gift Shoppe for featuring my French Apple Cobbler ! Thank you to The Speckled Dog for featuring my Perfect Chocolate Cake. It really is fabulous! You will love it! Thank you It's A Blog Party for featuring the Valentine Pins as a Top 10 Favorite! My Perfect Chocolate Cake has been nominated for "Best in Show" at LambAround ! 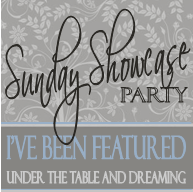 And it was featured in the "Sunday Showcase" at Under the Table and Dreaming and at The Speckled Dog's "Favorite Things Friday" ! 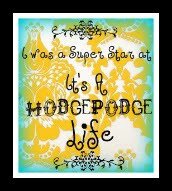 I would like to thank Confessions of a Vi3tBabe for featuring this blog on her So Followed Saturday Blog Hop. Please stop by her blog and check it out! Thank you Fudge Ripple for featuring my Cheese Ball recipe ! Love the idea of forming a log and freezing for later use. Thank you "It's So Very Cheri" for featuring my recipe for "Cheese Balls"! Thank you so much LambAround for nominating my Holiday Spritz Cookies into your Best of Show contest. Feel free to pop over and cast your vote!! My Valentine Pins were featured at Sugar Bee. Check them out! Thank you! Eccentric Delirium is featuring "a little bit of everything" this week ! Thank you Santa's Gift Shoppe for choosing Chocolate Spritz Cookies as one of your faves ! Thank you Bobbypin's Boardwark and 504 Main for featuring my Wine Cork Bulletin Board on your blogs ! Thank you, Ellen, from Creative Passage for selecting A Little Bit of Everything to receive this award ! 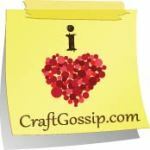 Thank you CraftGossip.com for featuring my Napkin Buttonhole blog entry ! The delectable Chocolate Cookies have been featured at Sugar Bee. Thank you so much ! Thank you so much to Holly at 504 Main for featuring "a little bit of everything" today ! Be sure to visit her blog and check it out....you'll be "tickled pink"! Thank you to Sueberry Lane for The Versatile Blogger Award! This week my "Personalized Baby Books" were featured at Delicious Ambiguity. Take a look ! And "Pizza on a Stick" was featured at It's a Blog Party ! Thank you Bird Crafts for featuring my baby shower cake on your Party post! And New Nostalgia for featuring Pizza On A Stick ! I have been featured once again! At Avid Accents: My DYI Diary and at Brambleberry Cottage I was featured for a unique and yet so simple "fix" for clip ear rings to make them suitable for pierced ears. And at Lucky Star Lane my baby shower cake and cookies were featured! Thank you so much! for Chicken Kiev. 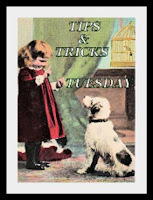 She is fond of good recipes and you can check out some more of her favorites at her blog. Thank you ! Thank you "It's A Blog Party" for choosing "Personalized Baby Books" as one of her "faves" this week! Thank you so much to New Nostalgia for featuring my Old Fashioned Bread Rolls. Check out her other features as well ! My Sundae Bubble Crown has been featured here. It IS a dessert that does not disappoint! Thank you for highlighting it! I am pleased to be featured for the second time at the Boardwalk Bragfest ! Thank you so much! Have you been to the Treehouse yet? 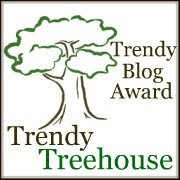 Well, it seems Tara is giving out awards to blogs she deems trendy and WOW! has chosen ME as one of HER top ten! Thank you so much! My Chocolate Brownie Waffles were a winner! Thank you so much to Simply Sweet Home for featuring my brownie waffles on her blog this week! Talk about an abundance of riches - yet another feature for "a little bit of everything"! Who knew just how popular Dog Bone Treats for Ralphie would be! Thank you to My Backyard Eden for highlighting this entry on her blog. Check it out ! This is a big day! 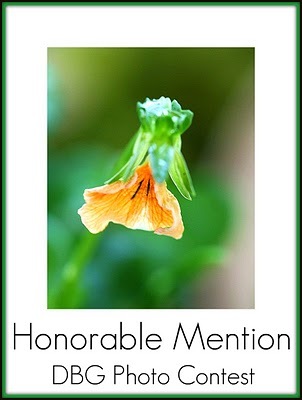 I just learned that in addition to being a "Lucky Sponsor" at Trendy Treehouse, two of my photographs merited Honorable Mention in the Designs by Gollum Photo Contest. Do stop by and check them out ! Thank you so much to Trendy Treehouse for choosing "a little bit of everything" as her "lucky sponsor" on Marketing Mondays April 18th !! What a pleasant surprise ! 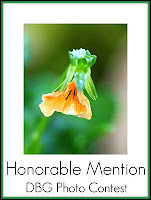 I was pleasantly surprised to receive a Beautiful Blog Award from Our Comfy-Cozy Life and I thank her for giving me a shout out! 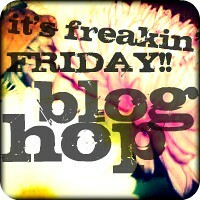 Do stop by her blog,check it out and become a follower! Thank you to Support Blog for Moms of Boys!